Metabolism by cytochrome P4503A (CYP3A) is the most prevalent clearance pathway for drugs. Designation of metabolism by CYP3A commonly refers to the potential contribution by one or both of two enzymes, CYP3A4 and CYP3A5. The metabolic turnover of 32 drugs known to be largely metabolized by CYP3A was examined in human liver microsomes (HLMs) from CYP3A5 expressers (*1/*1 genotype) and nonexpressers (*3/*3 genotype) in the presence and absence of ketoconazole and CYP3cide (a selective CYP3A4 inactivator) to calculate the contribution of CYP3A5 to metabolism. Drugs with the highest contribution of CYP3A5 included atazanavir, vincristine, midazolam, vardenafil, otenabant, verapamil, and tacrolimus, whereas 17 of the 32 tested showed negligible CYP3A5 contribution. For specific reactions in HLMs from *1/*1 donors, CYP3A5 contributes 55% and 44% to midazolam 1′- and 4-hydroxylation, 16% to testosterone 6β-hydroxylation, 56% and 19% to alprazolam 1′- and 4-hydroxylation, 10% to tamoxifen N-demethylation, and 58% to atazanavir p-hydroxylation. Comparison of the in vitro observations to clinical pharmacokinetic data showed only a weak relationship between estimated contribution by CYP3A5 and impact of CYP3A5 genotype on oral clearance, in large part because of the scatter in clinical data and the low numbers of study subjects used in CYP3A5 pharmacogenetics studies. 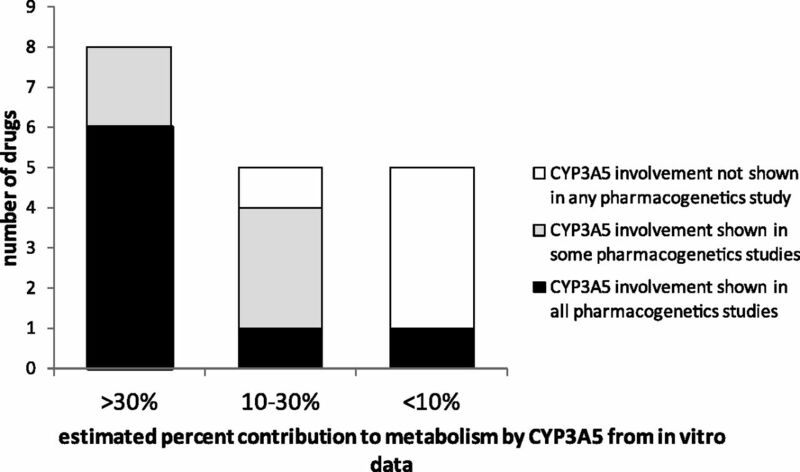 These data should be useful in guiding which drugs should be evaluated for differences in pharmacokinetics and metabolism between subjects expressing CYP3A5 and those who do not express this enzyme. Cytochromes P4503A (CYP3A) are the most important drug-metabolizing enzymes involved in drug clearance (Evans and Relling, 1999). The CYP3A family of enzymes in humans consists of CYP3A4, 3A5, 3A7, and 3A43. In drug metabolism, the focus has largely been on CYP3A4. CYP3A4 and CYP3A5 are very similar, having 85% overlap in amino acid sequence (Guengerich, 2005). Both enzymes catalyze the metabolism of the same substrates and, with few exceptions, the two enzymes catalyze the same specific reactions (e.g., midazolam 1′- and 4-hydroxylations, testosterone 6β-hydroxylation, nifedipine dehydrogenation) (Niwa et al., 2008). An emerging importance for CYP3A5 has been appreciated, primarily because expression of this enzyme is subject to a genetic polymorphism wherein most humans do not express it (Lamba et al., 2002). Some CYP3A-cleared drugs, such as tacrolimus (Hesselink et al., 2003; Tada et al., 2005; Haufroid et al., 2006) and verapamil (Jin et al., 2007), have been shown to exhibit different pharmacokinetics in CYP3A5 extensive metabolizers (EMs) and poor metabolizers (PMs), suggesting that CYP3A5 plays an important role in their clearance. To date, it has been challenging to use in vitro tools to gain an understanding of the relative roles of CYP3A4 and CYP3A5 to drug metabolism. Metabolism of drugs can be observed in recombinant heterologously expressed CYP3A4 and CYP3A5, (such as data reported in Williams et al., 2002), but understanding how data gathered in these systems can relate to in vivo is challenging because we lack the scaling factors necessary to convert kinetic data in these systems to in vivo relevance (Williams et al., 2003). Substrates and inhibitors that show selectivity for one enzyme compared with another have only recently become available. Vincristine undergoes a specific CYP3A5-catalyzed reaction (Dennison et al., 2006); however, an authentic standard of the metabolite of this chemically complex molecule that could be used in quantitative studies is not available. Also, the N-oxidation of T-1032 (an experimental phosphodiesterase inhibitor) was recently shown to be catalyzed by CYP3A5 and not CYP3A4 (Li et al., 2014). Also, inhibitors have been identified that selectively inhibit CYP3A4: SR-9186, which is a reversible inhibitor (Li et al., 2012), and CYP3cide, which is a mechanism-based inactivator (Walsky et al., 2012). These compounds offer the potential to distinguish the relative contributions of CYP3A4 and CYP3A5 to metabolism of drugs in human liver microsomes (HLMs). In this study, CYP3cide was used as a tool to define quantitatively the relative contributions of CYP3A4 and CYP3A5 to the metabolism of 32 drugs known to have CYP3A involvement in their metabolism. Enzyme kinetics of several specific drug metabolism reactions, including midazolam 1′- and 4-hydroxylations, testosterone 6β-hydroxylaton, and atazanavir hydroxylation, were examined in HLMs with and without CYP3cide to determine the role of CYP3A5 to these reactions. These data are compared with enzyme kinetic data gathered in recombinant systems. Substrates, metabolite standards, internal standard (IS), and inhibitors were obtained from the following sources: atazanavir and simvastatin, (Sequoia Research Products, Pangbourne, UK); verapamil, loratadine, quinine, cilostazol, busprione, ketoconazole, alprazolam, triazolam, quinidine, oxycodone, testosterone, 6β-hydroxytestosterone, indinavir nisoldipine, dronedarone, terfenadine, everolimus; saquinavir, quetiapine, nifedipine, felodipine, vardenafil, tacrolimus, ebastine, diltiazem, vincristine, metoprolol (IS), dextromethorphan (IS), and NADPH (Sigma-Aldrich, St. Louis, MO); 1′-hydroxyalprazolam, 4′-hydroxyalprazolam, 1′-hydroxytriazolam, and 4′-hydroxytriazolam (Enzo Life Sciences, Farmingdale, NY); midazolam, [2H3]6β-hydroxytestosterone, [2H5]1′-hydroxyalprazolam, and [2H4]1′-hydroxytriazolam (Cerilliant Corporation, Austin, TX); otenabant, rimonabant, erythromycin, clarithromycin, 1′-hydroxymidazolam, 4′-hydroxymidazolam, [2H4]1′-hydroxymidazolam, CYP3cide, p-hydroxyatazanavir, and t-butyl-hydroxyatazanavir were prepared at Pfizer (Groton, CT). Single genotyped HLMs used in this study are similar to those from Walsky et al. (2012). CYP3A5 *1/*1: BD Biosciences (BD) HH47, HH86, HH107, BD HH785, and BD HH867; and CYP3A5 *3/*3: HH71, HH78, HH81, HH95, HH96, HH109, and BD HH189] were obtained from BD Biosciences (San Jose, CA). The BD designation in front of some microsomal donor samples indicates the sample has been genotyped and immunoquantified for CYP3A4 and CYP3A5 by BD Biosciences; otherwise, the donor characterizations were conducted by Pfizer, Inc. Lots BD HH47, HH86, HH107, BD HH785, and BD HH867 (designated as *1/*1) were further genotyped for *6 and *7 alleles and were verified as not possessing those alleles except for lot HH86, for which the microsomes did not yield an adequate DNA sample. Pooled lots of HLM CYP3A5 *1/*1 (from five donors) and HLM CYP3A5 *3/*3 (from six donors) were prepared by pooling equal amounts of microsomal protein of each of the abovementioned lots (except BD HH189) such that the resulting enzymatic activity (measured by β-OH testosterone formation) is similar in the two lots. Recombinant heterologously expressed CYP3A4 and CYP3A5 were prepared under contract by Panvera Corp. (Madison, WI). Intrinsic Clearance Measurement in HLM *1/*1 and HLM *3/*3. Drugs (1.0 µM) were incubated with CYP3A5 *1/*1 and CYP3A5 *3/*3 HLMs at protein concentrations of 0.2 to 2 mg/ml, depending on the lability of the compound. Incubations were carried out in triplicate in 100 mM KH2PO4 (pH 7.4) containing MgCl2 (3.3 mM), ketoconazole (2 μM), or CYP3cide (0.5–2.5 μM based on protein concentration in the incubation) and NADPH (1.3 mM) in a total volume of 0.3 ml. Incubations were commenced with the addition of NADPH and carried out in a 96-well heating block at a temperature of 37°C. At times ranging between 0 and 120 minutes, aliquots (0.03 ml) were removed and added to 0.120 ml of termination solution (100% CH3CN) containing metoprolol (0.5 µM) as an IS. Terminated incubation mixtures were analyzed by liquid chromatography-tandem mass spectrometry (LC-MS/MS); details are included in Supplemental Table 1. The triplicate intrinsic clearance (CLint) determinations were averaged. Intrinsic Clearance Measurement in Recombinant CYP3A4 and CYP3A5. Drugs (1.0 µM) were incubated with recombinant CYP3A4 and CYP3A5 at P450 concentrations of 2–100 pmol/ml, depending on the lability of the compound. Incubations were carried out in duplicate in 100 mM KH2PO4 (pH 7.4) containing MgCl2 (3.3 mM) and NADPH (1.3 mM) in a total volume of 0.3 ml. Incubations were commenced with the addition of NADPH and carried out in a 96-well heating block at a temperature of 37°C. At times ranging between 2 and 60 minutes, aliquots (0.03 ml) were removed and added to 0.06 ml of termination solution (20% CH3CN/5% HCOOH) containing dextromethorphan (0.5 µM; m/z 272.2) as an IS. Terminated incubation mixtures were analyzed using an LC-MS system comprising an Acquity high-performance liquid chromatography coupled to a Micromass G2 time-of-flight MS operated in the positive ionization mode. Chromatography was carried out on a Phenomenex Kinetex column (2.1 × 50 mm; 1.7-µm particle size) with a mobile phase composed of water (A) and CH3CN (B) containing 0.1% formic acid at a flow rate of 0.4 ml/min. Samples (0.01 ml) were injected, and the mobile phase composition was maintained at 95%A/5%B for 0.5 minutes followed by a linear gradient to 10%A/90%B at 2.5 minutes and held for 0.5 minute. The MS was operated in the full scanning mode from 200 to 900 Da. Analyte peaks were quantitated by extracting the ion current for the protonated (or in some instances sodiated) molecular ion to a mass accuracy of 0.1 Da and comparing the response for the internal standard. Vincristine was analyzed on a Thermo Orbitrap Elite MS with the Thermo Accela LC system. The column was an Acquity HSS T3 (2.1 × 100 mm; 1.8 µm), and the mobile phase used was as described already, with a gradient program of 90%A for 0.5 minute, linear gradient to 20%A at 5 minutes, a 2-minute wash at 5%A, and a 2-minute re-equilibration at initial conditions, all at a flow rate of 0.3 ml/min. Vincristine was monitored using its diprotonated molecular ion (m/z 413.208). The duplicate intrinsic clearance determinations were averaged. Enzyme kinetic parameters were determined for midazolam, testosterone, alprazolam, triazolam, tamoxifen, and atazanavir. 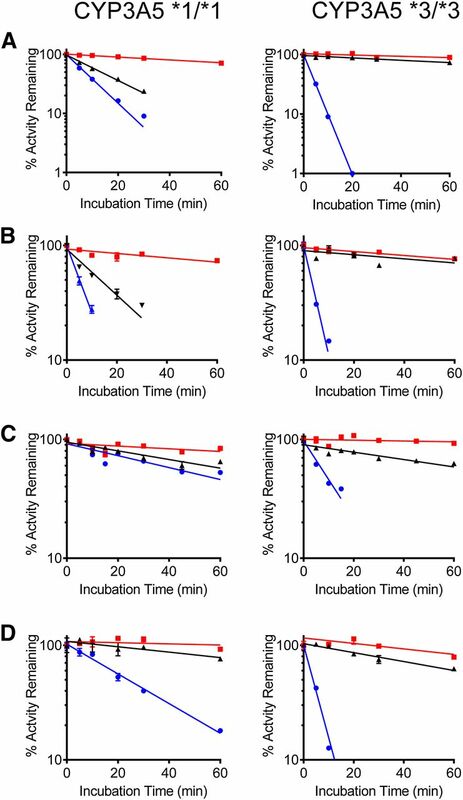 Compounds were incubated with CYP3A5 *1/*1 HLM, CYP3A5 *3/*3 HLM, and recombinant CYP3A4 and CYP3A5 under conditions where formation of metabolites were linear with respect to protein concentrations and length of incubation time (data not shown). Incubations were carried out in triplicate (except for atazanavir, which was carried out in duplicate) in 100 mM KH2PO4 (pH 7.4) containing MgCl2 (3.3 mM), ketoconazole (2 μM), or CYP3cide (0.5 or 2.0 μM based on protein concentration used in the incubation) and NADPH (1.3 mM) in a total volume of 0.2 ml. Incubations were commenced with the addition of NADPH and carried out in a 96-well heating block at a temperature of 37°C. At incubation times predetermined for each substrate reaction, aliquots (0.1 ml) were removed and added to 0.2 ml of termination solution (100% CH3CN) containing an internal standard. Specific incubation conditions and concentration range tested for each substrate can be found in Supplemental Table 2. (3)Kinetic constants were estimated from the substrate saturation experiments using the Michaelis-Menten module in GraphPad 5 for Windows (version 5.01). Relative Contributions of CYP3A4 and CYP3A5 in HLMs for 32 Drugs. Two lots of HLMs were used to gain an initial assessment of the relative importance of CYP3A4 and CYP3A5 to the metabolic lability of 32 drugs for which CYP3A metabolism is considered important (Tables 1 and 2). The representative lot of CYP3A5 EM HLM used was HH47, a donor genotyped as *1/*1, and with an overall testosterone 6β-hydroxylase activity of 4.1 nmol/min/mg at a substrate concentration of 200 µM, as determined by the vendor. The overall CYP3A contribution to substrate consumption was determined by the impact of ketoconazole (2 µM). The contribution of CYP3A4 in this lot of HLM was inhibited by CYP3cide, thus leaving the remainder that was inhibited by ketoconazole but not inhibited by CYP3cide as the CYP3A5 contribution. This finding was corroborated by conducting the same set of incubations in HLMs from donor HH189, a CYP3A5 PM genotyped as *3/*3 with an overall testosterone 6β-hydroxylase activity of 13.6 nmol/min/mg. For HH189, it is expected that all CYP3A contribution is due to CYP3A4 and that the inhibition by ketoconazole and CYP3cide will be the same (i.e., within experimental variability). Examples of the data from this type of experiment are shown in Fig. 1. For midazolam, otenabant, and atazanavir, there is a considerable contribution by CYP3A5 in the *1/*1 donor microsomes, and this contribution is illustrated by the difference in lability between the ketoconazole and CYP3cide-containing incubations. For nifedipine, there is little difference between the ketoconazole and CYP3cide data, indicating little contribution of CYP3A5. In the *3/*3 donor microsomes, the lability of all four drugs is similar in the incubations containing ketoconazole or CYP3cide, consistent with the absence of catalytically active CYP3A5 and thus minimal contribution to metabolism. Lability of selected CYP3A metabolized drugs in the presence and absence of ketoconazole and CYP3cide in human liver microsomes from a CYP3A5 extensive metabolizer (*1/*1) and poor metabolizer (*3/*3). (A) Midazolam. (B) Otenabant. (C) Atazanavir. (D) Nifedipine. Circles: control; Squares: + ketoconazole; Triangles: +CYP3cide. In HH47 (CYP3A5 EM), two drugs were shown to have CYP3A5 as the dominant contributor: atazanavir with an estimate of 82% and vincristine with an estimate of 75% (Table 1). Midazolam, rimonibant, otenabant, vardenafil, tacrolimus, and verapamil had comparable contributions of CYP3A4 and CYP3A5. Other drugs appeared to be exclusively CYP3A4 metabolized, as the impact of ketoconazole and CYP3cide were nearly identical. These included erythromycin, clarithromycin, everolimus, alprazolam, loratadine, and quinidine, among others. In HH189 (CYP3A5 PM), the impact of ketoconazole and CYP3cide on the CLint of all of the drugs was similar (Table 2), as expected, and this essentially served as an internal control that the approach used was functioning properly. Clearance of Drugs by Recombinant CYP3A4 and CYP3A5. The lability of drugs was measured in recombinant CYP3A4 and CYP3A5 to determine intrinsic clearance (Table 3). Lability values ranged from a high of 240 µl/min/pmol for the CYP3A4 catalyzed metabolism of simvastatin to oxycodone, which CYP3A5 appeared to not metabolize at all. The CLint measured in recombinant CYP3A5 correlated with the CLint value calculated for the CYP3A5 contribution to metabolism in HH47 from Table 1 (r2 = 0.77; Fig. 2A). This finding further supports the approach of using the difference in inhibition by ketoconazole and CYP3cide in CYP3A5 EM liver microsomes to establish the CYP3A5 catalyzed intrinsic clearance. (A) Correlation between intrinsic clearance measured in recombinant CYP3A5 and intrinsic clearance calculated to be attributable to CYP3A5 in liver microsomes from a CYP3A5 *1/*1 donor (r2 = 0.771). (B) Comparison of the estimated contribution of CYP3A5 to metabolism of drugs in liver microsomes from a CYP3A5 *1/*1 donor versus the ratio of intrinsic clearance values measured in recombinant CYP3A5:recombinant CYP3A4. The dashed line represents a line of 1:1 correspondence. In Fig. 2B, a comparison is made between the ratio of CLint values in recombinant CYP3A4 and CYP3A5 with the estimated relative contribution of CYP3A5 versus CYP3A4 in liver microsomes from HH47. In this case, the correlation was not strong (r2 = 0.31), but there was a general trend that drugs with relatively greater estimated contributions by CYP3A5 also had higher values for the ratio of recombinant CYP3A5/CYP3A4 CLint values. If the CLint value for recombinant CYP3A5 was twice that of CYP3A4, then in HH47, the CYP3A5 contribution to intrinsic clearance was at least 40%. Examples include atazanavir, midazolam, vardenafil, tarcolimus, vincristine, and rimonabant. However, the reverse was not always true; there were a few drugs for which CYP3A5 was estimated to contribute more than 40% in liver microsomes but for which the ratio of CLint values in recombinant 3A5 and 3A4 was not greater than two (e.g., verapamil, otenabant, and quinine). Relative Contributions of CYP3A4 and CYP3A5 in HLM to Specific CYP3A Catalyzed Reactions. The enzyme kinetics of specific CYP3A-catalyzed reactions were examined in HLM pooled from CYP3A5 *1/*1 and *3/*3 donors in the presence and absence of ketoconazole and CYP3cide to make estimates of the relative contributions of CYP3A4 and CYP3A5. Reactions examined included midazolam 1′-hydroxylase and testosterone 6β-hydroxylase, which are the two most frequently used reactions to probe CYP3A activity. Several other reactions were also examined (midazolam 4-hydroxylase, triazolam 1′- and 4-hydroxylase, alprazolam 1′- and 4-hydroxylase, tamoxifen N-demethylase, and atazanavir p-hydroxylase and t-butylhydroxylase). Enzyme kinetic parameters are listed in Table 4. Enzyme kinetic parameters (KM and Vmax) measured in CYP3A5 EM and PM pooled HLMs were comparable for individual isoform-catalyzed reactions, and were similar to literature values (Walsky and Obach, 2004). The impact of ketoconazole (2 µM) and CYP3cide (0.5 µM) on these reactions was evaluated in *1/*1 and *3/*3 pooled liver microsomes. For the *3/*3 pool (CYP3A5 PM), inhibition by ketoconazole and CYP3cide was nearly identical in all cases, consistent with the hypothesis that all the CYP3A contribution to these reactions is composed of only CYP3A4 (Fig. 3). For the *1/*1 pool, inhibition by ketoconazole was greater than inhibition by CYP3cide, indicating a role for CYP3A5 in these reactions. The percentage contributions (assessed by effect on CLint) by CYP3A4 and CYP3A5 in *1/*1 HLM are listed in Table 5. 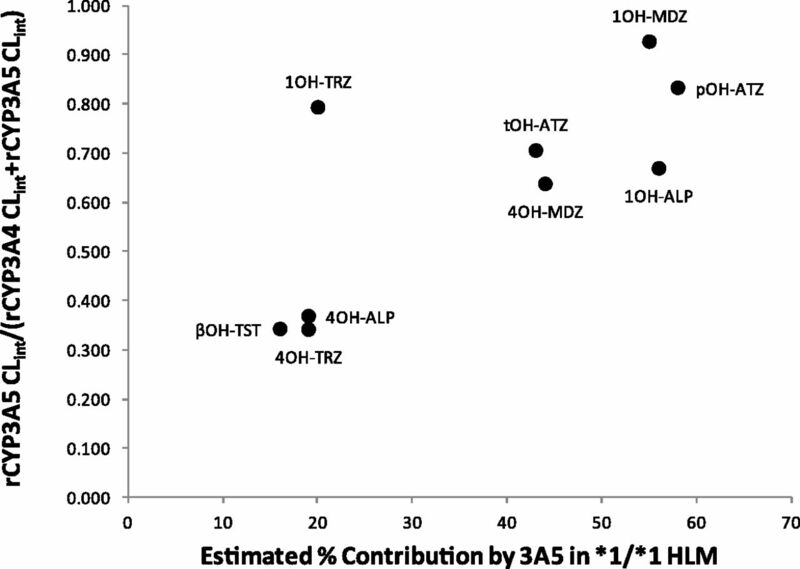 The CYP3A5 contribution was greatest for the 1′-hydroxylation reactions for midazolam and alprazolam (55% and 56%, respectively) as well as the p-hydroxylation reaction for atazanavir (58%). For alprazolam and midazolam, the 4-hydroxyation had CYP3A4 as the greater contributor. Thus, it can be readily observed that the relative contributions of CYP3A4 and CYP3A5 can differ for different reactions on the same substrate. For testosterone 6β-hydroxylase, a well known and highly used marker reaction for CYP3A activity, it was shown that the contribution of CYP3A5 in *1/*1 donors was relatively low (16%). Estimated contribution of CYP3A5 to several CYP3A catalyzed reactions in human liver microsomes from *1/*1 and *3/*3 donors, using ketoconazole and CYP3cide. Closed diamonds (+ ketoconazole: all CYP3A); open squares (+ CYP3cide: CYP3A4 only); open triangles (difference between ketoconazole and CYP3cide inhibition: CYP3A5). Midazolam 1′-hydroxylation in *1/*1 (A) and *3/*3 (B). Midazolam 4-hydroxylation in *1/*1 (C) and *3/*3 (D). Atazanavir p-hydroxylation in *1/*1 (E). Atazanavir p-hydroxylation in *3/*3 (F). Atazanavir t-butyl hydroxylation in *1/*1 (G). Atazanavir t-butyl hydroxylation in *3/*3 (H). Enzyme Kinetics in Recombinant CYP3A4 and CYP3A5. The enzyme kinetics of several of the reactions investigated were also measured using recombinant heterologously expressed CYP3A4 and CYP3A5 (Table 6). The reactions with the highest ratio of CYP3A5 CLint to CYP3A4 CLint were midazolam 1′-hydroxylase, triazolam 1′-hydroxylase, and atazanavir p-hydroxylase. It should follow that the reactions that had the highest 3A5/3A4 ratio would have the greatest estimates of CYP3A5 relative contribution in *1/*1 donor HLM. This was mostly the case (Fig. 4), albeit the relationship is not perfect. Comparison of the estimated contribution of CYP3A5 to specific drug metabolism reactions in liver microsomes from a CYP3A5 *1/*1 donor versus the ratio of intrinsic clearance values measured in recombinant CYP3A5:recombinant CYP3A4. 1OH-ALP: alprazolam 1′-hydroxylase; 4OH-ALP: alprazolam 4-hydroxylase; 1OHMID: midazolam 1′-hydroxylase; 4OH-MID: midazolam 4-hydroxylase; 1OH-TRZ: triazolam 1′-hydroxylase; 4OH-TRZ: triazolam 4-hydroxylase; βOH-TST: testosterone 6β-hydroxylase; pOH-ATZ: atazanavir p-hydroxylase; tOH-ATZ: atazanavir t-butyl hydroxylase. The CYP3A family of drug metabolizing enzymes is the most important with regard to the number of drugs cleared by this enzyme as well as drug-drug interactions of clinical relevance being caused by inhibitors of CYP3A (e.g., azole antifungals, macrolide antibiotics, others). Most of the CYP3A-cleared drugs have been largely ascribed to the activity of CYP3A4. However, it has become increasingly apparent that CYP3A5 can also contribute. Since CYP3A5 is subject to a genetic polymorphism in which a large proportion of the population does not express it (Lamba et al., 2002), identification of a contribution of CYP3A5 to the metabolism of a drug is now recognized as important. Until recently, a reliable in vitro tool to separate experimentally the relative contributions of CYP3A4 and CYP3A5 was not available. Recombinant heterologously expressed CYP3A5 is available and multiple drugs have been examined using these enzymes (Williams et al., 2002; Niwa et al., 2008, and Table 3), but there are no known substrates or reactions that show specificity for CYP3A5 versus CYP3A4 from which relative activity factors for these two enzymes can be calculated. It had been previously suggested that midazolam 1′-hydroxylase was potentially a better reaction for CYP3A5 than for CYP3A4 (Gibbs et al., 1999). This work used inferences from the enzyme kinetics of the reaction in HLMs and recombinant heterologously expressed systems as well as different inhibitory potencies for ketoconazole (Shirasaka et al., 2013). However, it is still clear from that work that both enzymes contributed and ascribing a particular percentage to each enzyme was not readily attainable. In previous efforts in our laboratories, we identified CYP3cide as a compound that selectively inactivates CYP3A4 while leaving CYP3A5 largely unaffected. This in vitro tool now permits an estimation to be made for the contribution of CYP3A5 to the metabolism of drugs in liver microsomes from donors expressing this enzyme. Because CYP3cide is an inactivator of CYP3A4 (rather than CYP3A5), a method whereby the impact of a compound that potently inhibits both CYP3A4 and CYP3A5 (ketoconazole) must be first measured to determine the entire CYP3A contribution. Then these data are compared with that generated with CYP3cide, which inhibits only CYP3A4. The calculated difference between these two then becomes the estimated contribution of CYP3A5. This approach was used to evaluate the CYP3A5 contribution to several drug metabolism reactions that have been extensively used as CYP3A probe reactions. Interestingly, for midazolam, it appears that the 1′-hydroxylase reaction has a moderately greater contribution from CYP3A5 versus CYP3A4 in liver microsomes of *1/*1 donors. This is consistent with previous findings (Gibbs et al., 1999; Walsky et al., 2012). However, for testosterone 6β-hydroxylase, the CYP3A4 contribution is dominant. As these two reactions are frequently used as marker reactions to test compounds as inhibitors of CYP3A, it becomes a possibility that a compound that inhibits one 3A enzyme and not the other could show different effects on different substrates (Shirasaka et al., 2013). It has been proposed that when testing new agents for inhibition of CYP3A, more than one probe reaction be used (Bjornsson et al., 2003). Although this suggestion may be driven from a notion that CYP3A4 has different substrate/inhibitor binding sites (Kenworthy et al., 1999), it can also be the case that test compounds could show substrate-dependent inhibition because of different potencies toward CYP3A4 versus CYP3A5. CYP3A5 is subject to a genetic polymorphism wherein a large proportion of the population does not express the enzyme, whereas those who possess at least one copy of the *1 allele do express it. There have been trends in allele frequency identified among different races: populations of African descent have a higher prevalence of expressing CYP3A5 than other races, and ranges of expression for CYP3A5 can be as high as 200 pmol/mg of liver microsomal protein (Kuehl et al., 2001). This can lead to differences in pharmacokinetics between CYP3A5 expressers and nonexpressers. In the case of the CYP3A5 polymorphism, it is the minority population who are expressers, and in this case, the concern is around these individuals clearing the substrate too fast, thereby not achieving high enough drug exposure for efficacy (Jin et al., 2007; Chen et al., 2009). Differences in exposure to and/or effect of CYP3A-cleared drugs between CYP3A5 EM and PM subjects have been shown for tacrolimus (Barry and Levine, 2010), verapamil (Jin et al., 2007; Langaee et al., 2007), and atazanavir (Wempe and Anderson, 2011). Possessing an in vitro method to identify those drugs that could show pharmacokinetic differences between CYP3A5 EM and PM subjects is important, and the method described in this report using CYP3cide fulfills that need. Thirty-two drugs purported to have a high degree of CYP3A contribution to their clearance in humans were selected for this study. A summary of clinical studies wherein the impact of CYP3A5 genotype was assessed for drugs included in the study is in Table 7. Drugs with the greatest dependence on CYP3A5 would be expected to show a high degree of inhibition by ketoconazole but a low inhibition by CYP3cide in liver microsomes from CYP3A5 expressers. However, a comparison of clinical observations on the impact of CYP3A5 genotype with the in vitro data shows that the relationship is not straightforward. In some instances, there is good agreement. However, for some drugs, there is no agreement between in vitro and in vivo, and there is an inexplicable lack of agreement even among findings of different studies on the same drug in the clinical literature (e.g., midazolam, simvastatin, nifedipine) (Table 7). Atazanavir has been shown to have greater exposures in CYP3A5 PM subjects (1.4- to 2.1-fold, depending on ethnicity) (Anderson, et al., 2009), and population pharmacokinetic analysis also supports a considerable contribution of CYP3A5 metabolizer status to atazanavir oral clearance (Kile et al., 2012; Savic et al., 2012) and circulating metabolite profile (Wempe and Anderson, 2011). These findings are also consistent with our in vitro data that showed an 80% overall contribution from CYP3A5 to atazanavir consumption in liver microsomes pooled from *1/*1 donors (Table 1) and an estimate of 58% and 43% contribution to formation of two of the major metabolites (Table 3). Our findings suggest that CYP3A5 should have an impact on vincristine pharmacokinetics and metabolism in vivo. One study in a relatively small cohort of patients did not show an impact of CYP3A5 genotype on vincristine pharmacokinetics; however, the intersubject variability in exposure to this drug is large (Guilhamou et al., 2011), whereas another study showed a difference between CYP3A5 EM and PM subjects in vincristine and its M1 metabolite (Egbelakin et al., 2011). Midazolam, the clinical substrate of choice of CYP3A for DDI studies, has been extensively studied in human clinical trials. These trials include many studies investigating the effect of CYP3A genotype on exposure, where the results have been mixed (Wandel et al., 2000; Shih and Huang, 2002; Floyd et al., 2003; Wong et al., 2004; Yu et al., 2004; He et al., 2005; Lepper et al., 2005; Kharasch et al., 2007; Tomalik-Scharte et al., 2008; de Jonge et al., 2013; Elens et al., 2013). However, in a recent extensive clinical study conducted by Elens and colleagues (2013), 108 CYP3A4 and CYP3A5 genotyped cancer patients were giving an i.v. dose of midazolam to investigate the possible interplay. Those patients that were indicated as poor (CYP3A4 *22 and CYP3A5 *3/*3) or intermediate (CYP3A4 *1/*1 and CYP3A5 *3/*3) metabolizers saw a 50% and 16.9% increase in area under the curve compared with extensive metabolizers (CYP3A4 *1 and CYP3A5 *1/*1), respectively (Elens et al., 2013). Our in vitro data also indicate that approximately 50% of the formation of 1′-hydroxymidazolam by CYP3A5 expressers is mediated by CYP3A5 (Table 7). Several drugs appear to have little to no contribution by CYP3A5 and therefore should demonstrate no difference between CYP3A5 EM and PM subjects. Among these is oxycodone (Naito et al., 2011), and the data reported in this study are consistent with the oxycodone clinical data. However, previously reported data showed that recombinant CYP3A5 had a higher intrinsic clearance for oxycodone N-demethylation than CYP3A4 (Lalovic et al., 2004). Different CYP3A recombinant systems can have different activities because of the presence and abundance of P450 reductase and cytochrome b5 in the expression system (Bakken et al., 2009). This shows the value of the use of CYP3cide in intact HLMs, where CYP3A4 and CYP3A5 are present in their “natural” environment and should exhibit activities in proportion to that exhibited in vivo. A comparison of the prediction of the impact of CYP3A5 from in vitro with findings in clinical pharmacogenetic studies is shown in Fig. 5. At this point, caution should be used when interpreting the in vitro versus clinical findings as many of the clinical studies have low numbers of study subjects, and for some drugs (e.g., midazolam, simvastatin, others), there are separate clinical studies that have contradictory conclusions. Overall, the in vitro method using CYP3cide in liver microsomes from CYP3A5 *1/*1 shows which drugs have a sizable contribution of CYP3A5 to clearance. Based on our results, if an estimate of greater than ∼25%–30% contribution is made from in vitro data, then a clinical pharmacogenetic investigation is warranted. If less than that, then such a clinical investigation may not be as urgent, but monitoring the potential for CYP3A5 involvement through the use of population methods (e.g., detecting a difference in drug exposure or response among different races) may still be advisable. Comparison of estimated CYP3A5 contributions from in vitro substrate depletion data in *1/*1 HLMs to observations of CYP3A5 clinical impact. Note that alprazolam is the single example of a drug that had <10% estimated CYP3A5 contribution in vitro but was demonstrated to have a CYP3A5 contribution in a clinical study. If the data from the measurement of the impact of CYP3cide on 1′- and 4-hydroxyalprazolam metabolites are used, then an estimate of 27% contribution of CYP3A5 would be made. In conclusion, the application of an experimental design using HLMs from CYP3A5 *1/*1 donors and the CYP3A4 selective inactivator CYP3cide can discern the relative contributions of CYP3A4 and CYP3A5 to the metabolic clearance of CYP3A metabolized drugs. Among those drugs tested, atazanavir showed the greatest dependence of overall metabolism on CYP3A5. Furthermore, for some specific drug metabolism reactions (such as midazolam 1′-hydroxylation and atazanavir phenyl hydroxylation), CYP3A5 appears to contribute substantially in liver microsomes from CYP3A5 expressers. This in vitro experimental approach can help identify those drugs for which follow-up studies to compare the clinical pharmacokinetics of CYP3A substrates in CYP3A5 expressers versus nonexpressers should be conducted. The authors thank Angela Wolford for early efforts on this project; Gregory Walker for quantitative nuclear magnetic resonance used in the determination of stock concentrations of biosynthesized hydroxyatazanavir metabolites; Drs. Linda Wood and Jean-Claude Marshall for testing microsome lots for the CYP3A5 *6 and *7 alleles; Drs. Sophie Argon, Isabelle Ragueneau Majlessi, and Nina Isoherranen of the University of Washington for assistance in mining the University of Washington Drug Interaction Database for CYP3A5 clinical pharmacogenetic studies; Drs. Larry Tremaine (Pfizer) and Scott Grimm (AstraZeneca) for support of this research; and Dr. Tremaine for critical evaluation of the manuscript. Participated in research design: Tseng, Walsky, Goosen, Zientek, Obach. Conducted experiments: Tseng, Walsky, Luzietti, Harris, Kosa, Obach. Performed data analysis: Tseng, Walsky, Goosen, Zientek, Obach. Contributed to the writing of the manuscript: Tseng, Walsky, Goosen, Zientek, Obach. ↵1 Current affiliation: EMD Serono Research Institute, Billerica, Massachusetts. ↵2 Current affiliation: Agilux Laboratories, Worcester, Massachusetts. ↵3 Current affiliation: Incyte Corporation, Wilmington, Delaware. (2006) Pharmacogenetic characteristics of indinavir, zidovudine, and lamivudine therapy in HIV-infected adults: a pilot study. Journal of Acquired Immune Deficiency Syndromes (1999) 42:441–449. (2009) Atazanavir pharmacokinetics in genetically determined CYP3A5 expressors versus non-expressors. J Antimicrob Chemother 64:1071–1079. (2009) Metabolism of quetiapine by CYP3A4 and CYP3A5 in presence or absence of cytochrome B5. Drug Metab Dispos 37:254–258. (2003) The conduct of in vitro and in vivo drug-drug interaction studies: a PhRMA perspective. J Clin Pharmacol 43:443–469. (2009) Effect of CYP3A5 genotype on renal allograft recipients treated with tacrolimus. Transplant Proc 41:1557–1561. (2012) In vivo CYP3A4 activity, CYP3A5 genotype, and hematocrit predict tacrolimus dose requirements and clearance in renal transplant patients. Clin Pharmacol Ther 92:366–375. (2013) Impact of CYP3A5 genotype on tacrolimus versus midazolam clearance in renal transplant recipients: new insights in CYP3A5-mediated drug metabolism. Pharmacogenomics 14:1467–1480. (2011) Increased risk of vincristine neurotoxicity associated with low CYP3A5 expression genotype in children with acute lymphoblastic leukemia. Pediatr Blood Cancer 56:361–367. (2013) CYP3A4 intron 6 C>T SNP (CYP3A4*22) encodes lower CYP3A4 activity in cancer patients, as measured with probes midazolam and erythromycin. Pharmacogenomics 14:137–149. (1999) Pharmacogenomics: translating functional genomics into rational therapeutics. Science 286:487–491. (2003) Genotype-phenotype associations for common CYP3A4 and CYP3A5 variants in the basal and induced metabolism of midazolam in European- and African-American men and women. Pharmacogenetics 13:595–606. (2004) CYP3A5 genotype did not impact on nifedipine disposition in healthy volunteers. The Pharmacogenomics Journal 4:34–39. (1999) Inhibition of cytochrome P-450 3A (CYP3A) in human intestinal and liver microsomes: comparison of Ki values and impact of CYP3A5 expression. Drug Metab Dispos 27:180–187. (2010) Influence of CYP3A5 genotype on CP-945,598 pharmacokinetics and weight loss in the treatment of obese subjects. 9th International ISSX Meeting, Online Abstracts; 2010 Sept 4–8; Istanbul, Turkey. Suppl 5, No 2. International Society for the Study of Xenobiotics, Washington, DC. (2002) Explaining interindividual variability of docetaxel pharmacokinetics and pharmacodynamics in Asians through phenotyping and genotyping strategies. Journal of Clinical Oncology : Official Journal of the American Society of Clinical Oncology 20:3683–3690. (2011) Impact of plasma and intracellular exposure and CYP3A4, CYP3A5, and ABCB1 genetic polymorphisms on vincristine-induced neurotoxicity. Cancer Chemother Pharmacol 68:1633–1638. Guengerich FP(2005) Human cytochrome P450 enzymes. In: Cytochrome P450: Structure, Mechanism, and Biochemistry, 3rd ed. (Ortiz de Montellano PR, ed), pp. 377–530, Plenum Publishers, New York. , and Obstetric-Fetal Pharmacology Research Units N (2013) Nifedipine pharmacokinetics are influenced by CYP3A5 genotype when used as a preterm labor tocolytic. American Journal of Perinatology 30:275–281. .. (2006) CYP3A5 and ABCB1 polymorphisms and tacrolimus pharmacokinetics in renal transplant candidates: guidelines from an experimental study. Am J Transplant 6:2706–2713. (2005) Genotype-phenotype associations of cytochrome P450 3A4 and 3A5 polymorphism with midazolam clearance in vivo. Clinical Pharmacology and Therapeutics 77:373–387. (2007) CYP3A5 genotype has an impact on the metabolism of the HIV protease inhibitor saquinavir. Clinical Pharmacology and Therapeutics 81:708–712. (2007) Influence of CYP3A5 genotype on the pharmacokinetics and pharmacodynamics of the cytochrome P4503A probes alfentanil and midazolam. Clin Pharmacol Ther 82:410–426. 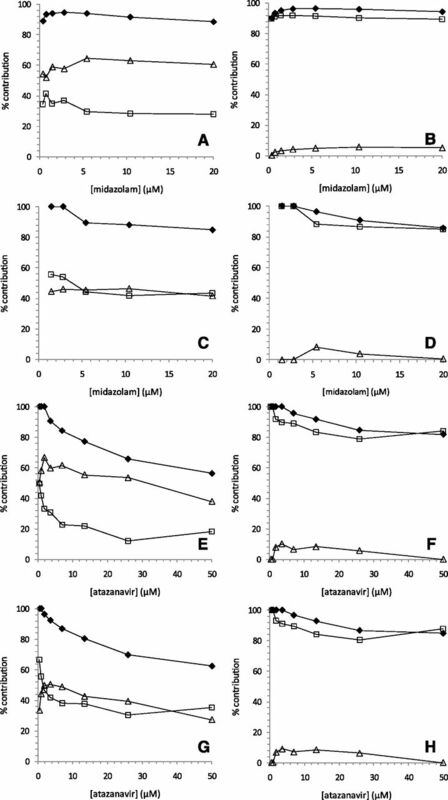 (2012) A population pharmacokinetic-pharmacogenetic analysis of atazanavir. AIDS Res Hum Retroviruses 28:1227–1234. (2007) Effect of polymorphic CYP3A5 genotype on the single-dose simvastatin pharmacokinetics in healthy subjects. Journal of Clinical Pharmacology 47:87–93. (2012) Clinical and genetic factors affecting tacrolimus trough levels and drug-related outcomes in Korean kidney transplant recipients. European Journal of Clinical Pharmacology 68:657–669. (2004) Quantitative contribution of CYP2D6 and CYP3A to oxycodone metabolism in human liver and intestinal microsomes. Drug Metab Dispos 32:447–454. (2007) Association of CYP3A5 polymorphisms with hypertension and antihypertensive response to verapamil. Clin Pharmacol Ther 81:386–391. (2005) Effect of common CYP3A4 and CYP3A5 variants on the pharmacokinetics of the cytochrome P450 3A phenotyping probe midazolam in cancer patients. Clin Cancer Res 11:7398–7404. (2014) Characterization of T-5 N-oxide formation as the first highly selective measure of CYP3A5 activity. Drug Metab Dispos 42:334–342. (2005) Variation in oral clearance of saquinavir is predicted by CYP3A5*1 genotype but not by enterocyte content of cytochrome P450 3A5. Clin Pharmacol Ther 78:605–618. (2011) CYP3A5*3 affects plasma disposition of noroxycodone and dose escalation in cancer patients receiving oxycodone. J Clin Pharmacol 51:1529–1538. (2011) Cytochrome P450 and ABCB1 genetics: association with quetiapine and norquetiapine plasma and cerebrospinal fluid concentrations and with clinical response in patients suffering from schizophrenia. A pilot study. Journal of Psychopharmacology (Oxford, England) 25:896–907. (2008) Comparison of kinetic parameters for drug oxidation rates and substrate inhibition potential mediated by cytochrome P450 3A4 and 3A5. Curr Drug Metab 9:20–33. (2006) Effect of CYP3A5*3 genotype on the pharmacokinetics and pharmacodynamics of alprazolam in healthy subjects. Clin Pharmacol Ther 79:590–599. (2011) CYP3A5 genotype does not influence everolimus in vitro metabolism and clinical pharmacokinetics in renal transplant recipients. Transplantation 91:652–656. (2013) CYP3A5 genotype, but not CYP3A4*1b, CYP3A4*22, or hematocrit, predicts tacrolimus dose requirements in Brazilian renal transplant patients. Clinical Pharmacology and Therapeutics 94:201–202. (2012) Effect of adherence as measured by MEMS, ritonavir boosting, and CYP3A5 genotype on atazanavir pharmacokinetics in treatment-naive HIV-infected patients. Clin Pharmacol Ther 92:575–583. (2002) Pharmacokinetics of midazolam and 1′-hydroxymidazolam in Chinese with different CYP3A5 genotypes. Drug Metab Dispos 30:1491–1496. (2013) Effect of CYP3A5 expression on the inhibition of CYP3A-catalyzed drug metabolism: impact on modeling CYP3A-mediated drug-drug interactions. Drug Metab Dispos 41:1566–1574. (2011) The disposition of three phosphodiesterase type 5 inhibitors, vardenafil, sildenafil, and udenafil, is differently influenced by the CYP3A5 genotype. Pharmacogenet Genomics 21:820–828. (2007) Minimal effect of MDR1 and CYP3A5 genetic polymorphisms on the pharmacokinetics of indinavir in HIV-infected patients. British Journal of Clinical Pharmacology 64:353–362. (2005) Impact of CYP3A5 and MDR1(ABCB1) C3435T polymorphisms on the pharmacokinetics of tacrolimus in renal transplant recipients. Transplant Proc 37:1730–1732. (2008) No role for the CYP3A5*3 polymorphism in intestinal and hepatic metabolism of midazolam. Eur J Clin Pharmacol 64:1033–1035. (2004) Validated assays for human cytochrome P450 activities. Drug metabolism and disposition: the biological fate of chemicals 32:647–660. (2000) CYP3A activity in African American and European American men: population differences and functional effect of the CYP3A4*1B5′-promoter region polymorphism. Clin Pharmacol Ther 68:82–91. (2011) Atazanavir metabolism according to CYP3A5 status: an in vitro-in vivo assessment. Drug Metab Dispos 39:522–527. (2003) A significant drug-metabolizing role for CYP3A5? Drug Metab Dispos 31:1526–1530. (2004) CYP3A5 genotype and midazolam clearance in Australian patients receiving chemotherapy. Clin Pharmacol Ther 75:529–538. (2005) Effects of the CYP3A5 genetic polymorphism on the pharmacokinetics of diltiazem. Clinica Chimica Acta; International Journal of Clinical Chemistry 362:147–154. (2009) Influence of CYP3A and CYP2C19 genetic polymorphisms on the pharmacokinetics of cilostazol in healthy subjects. Clinical Pharmacology and Therapeutics 86:281–284. (2004) Effect of the CYP3A5 genotype on the pharmacokinetics of intravenous midazolam during inhibited and induced metabolic states. Clin Pharmacol Ther 76:104–112. (2012) Measurement and compartmental modeling of the effect of CYP3A5 gene variation on systemic and intrarenal tacrolimus disposition. Clinical Pharmacology and Therapeutics 92:737–745. (2013) Effects of CYP3A5 and CYP2D6 genetic polymorphism on the pharmacokinetics of diltiazem and its metabolites in Chinese subjects. Die Pharmazie 68:257–260. (2013) Simvastatin pharmacokinetics in healthy Chinese subjects and its relations with CYP2C9, CYP3A5, ABCB1, ABCG2 and SLCO1B1 polymorphisms. Die Pharmazie 68:124–128.